A coalition of truck operators under the auspices of Joint Council of Seaport Truckers (JCOST) has blamed terminal operators for the recent truck accident that tilted off the Ojuelegba bridge last week killing three people. JCOST is a fusion of Nigerian Association of Road Transport Owners (NARTO), Road Transport Employers Association of Nigeria (RTEAN), Truck Terminal Users Association, Truck Drivers Unit (TDU) of the Maritime Workers Union of Nigeria (MWUN) and Association of Maritime Truck Owners (AMATO). Rising from a joint meeting yesterday, the Chairman of AMATO, Chief Remi Ogungbemi said terminal operators do not posses necessary equipment for loading of containers on truck at the ports that is why containers fall frequently. The AMATO chairman said, "The terminal operators too have not being doing enough in the area of providing necessary equipment to make sure that the trucks are well loaded and to even certify trucks suitable for carrying certain weight of goods." He also said government was part of the factors responsible for falling of trucks on the highway even as he said that the state of the roads were not good for vehicles to move safely. Ogungbemi pointed out that the government has failed to play its own role by providing suitable roads for their trucks to move and therefore should lay the entire blame on the truck drivers alone. 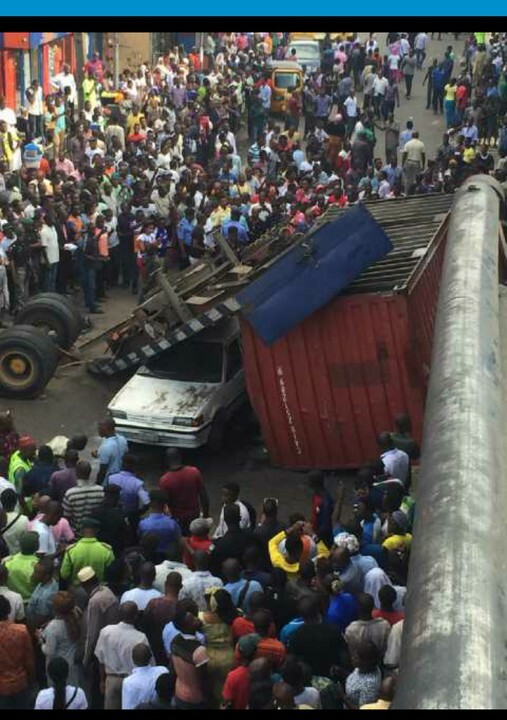 He added that the recent container that fell at Ojuelegba could be as a result of the state of the bridge because according to him, the bridge is tilted and could have caused the falling of the container. "The coalition of truck operators within the state that also represents other truck operators across the nation have resolved in today's meeting that we are not fighting government because the government is our government and it is our wish and prayer both the state and federal government will succeed and anyone who loves the government will not do anything that will have a negative effect on the government. "But as a result of the policy that the state government has decided to start implementing as regards the movement of trucks within the state so we have decided to withdraw our services until when the environment is conducive for us to operate. "As I speak, our intention formerly was to mellow down and see how things unfold but as I speak, we have started seeing sporadically some uniform men in military uniform, task forces arresting our members. He however quipped that the association highlighted the implications of such decisions of working at night even as he stated that most of the warehouses where the trucks supply goods do not operate at night. The coalition which said it regretted the rate at which the trucks were falling added that it had already started looking inwards to put up modalities to check mate members in conjunction with the regulations and policies that the authorities would put in place to ensure safety of lives and property. Meanwhile, the Chairman of JCOST, Mr. Kayode Odunowo said that members have decided to withdraw their services because the Lagos state directive would expose their members to dangers but would also not be comfortable for them to load their trucks in the night. The chairman JCOST who doubles as the Deputy State Chairman of NARTO said that the strike was inevitable as all plea with the Permanent Secretary fell on deaf ears during a meeting recently. "I think you are all aware of the latest development on Lagos roads; the pronouncement of the Lagos state government that container carrying trucks should not ply the roads between 6am and 9pm. "On Monday we went to Ikeja to see the PS (Permanent Secretary), we held a meeting with him and told him the implications behind all those decisions and he said there was nothing he could do and that the decision was final. "So, after all said and done, I asked him personally what is going to be the effect if we are not working between 6am and 9pm. I told him it is not possible for us to load containers in the night. Even when we load during the day, they still burgle our trucks," he stated.